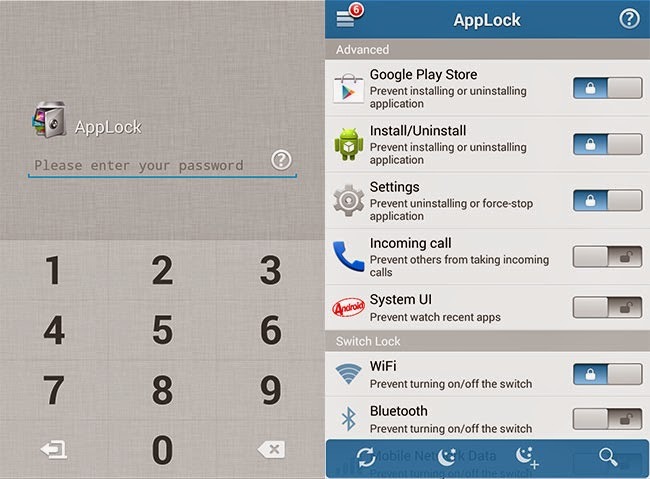 You can lock apps and other functions of your Android phone using a free app called Applock. The functions or app blocked by Applock can be unlocked only if someone knows a secret pin code. You can prevent any app from being accessed. When someone tries to tap and open an app, they will be prompted with a security code. Only after entering the secret code, it will be accessible. This locking feature can also be applied to many functions of your Android phone or tablet. You can set restrictions on turning off and on the Wi-Fi, mobile data network, Bluetooth and sync. You can also restrict someone from installing apps from the Play Store. Other restrictions include limiting picking up phone calls, app install/uninstallations and changes in settings. You can also directly hide photos and videos by placing them in the Vault. There are also additional plugins to extend the features. This app has been developed by keeping privacy and security in mind. When you are able to apply an authorization pin code to almost everything in your phone, you control your device even if someone else is using it. This helps you to prevent misuse of your phone. You can also keep your privacy intact by limiting access to your phone. Another great feature of Applock is that you can create multiple profiles with certain authorizations. That means you can have a guest account with all the limitations in place. Then you can create an administrator account for you to use without any limitations. This way, you can save time and not be bugged with the pin request when you are using your phone. But when you pass your device to someone else, they will be prompted with a lock code to the things that you want to block. The setup of this app requires no complex skills. First you create a new pin code and remember it. Then enter an email address in case you forget your pin code and have you recover it. After everything is set up, all you do is turn on and off the pin code against certain features or apps. IT is quite easy to use and is highly recommended to everyone looking to maximize security for their devices.